Why Your Building Needs a CTO | PLASTARC, Inc.
Smart buildings are changeful buildings. They’re equipped with technology that tracks which conference rooms are booked most often, recognizes when everyone’s gone and turns off the lights, and might even remember how you like your coffee from the espresso machine. Enabled by this new “digital layer” of user experience (UX), smart, responsive buildings are both a goldmine for companies who know how to leverage social data to make their space the best it can be, and increasingly the expectation of Next Gen occupants. We live and breathe tech-enabled personal lives. We find a restaurant online using Foursquare, make a reservation with OpenTable, eat dinner, then rate the experience. We summon a ride home using Uber and rate the driver. When we reach our living room, we dim the lights using Hue, ask the Netflix algorithm for a movie recommendation, then assign a star rating which will contribute to future suggestions. Now, understandably, we want to manage our work lives with the same convenience and efficacy by registering guests on LobbyLink, ordering our lunch through Seamless, finding a meeting venue on LiquidSpace—and then giving our two cents about how it all went. This is the emergent landscape of a digital workplace. PLASTARC sees this moment as the beginning of a golden age in which technology enables building design to focus almost exclusively on serving and sustaining human experience. The question is: who within your company will be in charge of monitoring your smart building’s operations? Who will be at the intersection of all these new tech features and the occupants who use them? Who will action the many opportunities for improvement that increasing waves of social data are delivering to our doorsteps? That’s right: your Chief (Building)Technology Officer (CTO). You do have one, don’t you? You can learn more about this pivotal role in a WorkTech Academy video interview with PLASTARC founder Melissa Marsh. In 1994, the inimitable Stewart Brand published How Buildings Learn: What Happens After They're Built, a book about the evolution of buildings and how they adapt to the changing requirements of occupants over time. In it, he detailed the concept of buildings’ six layers: site (the geographical location), structure (the foundation and load-bearing elements), skin (the exterior surfaces), services (the working “guts” of wiring and plumbing, and moving parts like elevators), space plan (the interior layout), and stuff (furniture, appliances, personal effects). Thinking about buildings as the product of these mostly mutable layers rather than as a monolithic whole is how both architects and occupants have historically engendered the built environment’s responsive changefulness. Now, as we enter the age of social data-driven design, PLASTARC sees a new, seventh layer—occupant-enabled digital experience—that takes changeability to unprecedented new heights and brings countless possibilities for innovation. Architects, interior designers, facilities managers—anyone involved with design in real estate—has probably felt envious of web interface designers: people who have always possessed the ability to move that virtual shopping cart around in A/B tests until they discover where users find it most easily. Now, friends, WE can move OUR shopping carts around! We can collect digital data about which rooms employees spend the most time in, determine the features that make those spaces so popular, and replicate them elsewhere. We can see how much time occupants actually spend at their dedicated desks, and evaluate the benefits of hot desking instead. We can more quickly and seamlessly address aspects of occupant comfort, from ambient temperature to preferred snacks. In short, we can use the data collected from buildings’ new seventh—digital—layer to make our workplaces ideal environments for employee happiness and productivity. In turn, the improvements we make will help us attract and retain today’s top talent: tech-savvy people who have come to expect such customization. Many organizations have come to embrace the relationship between human resources (HR) and real estate (RE), but we’re still not seeing as close a partnership between RE and tech. So here’s a bid for remembering that tech plus space equals our most powerful workplace tool. If we’re not thinking of these as collaborators, operating in sync, we’re missing out. 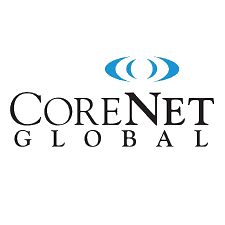 Technology is quickly changing how the corporate real estate industry operates. (Don’t believe us? Read the rest of this newsletter!) We’re looking forward to this March 30 event connecting commercial real estate professionals with emerging technologies and trends. In April, we’ll venture to Las Vegas to talk about how facilities managers can leverage buildings’ increasingly ubiquitous digital layer to become a force for both occupant and organizational satisfaction. 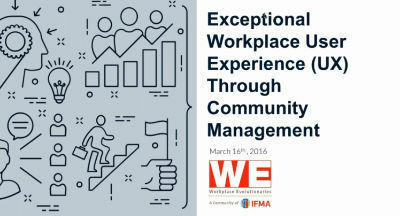 Just a few days ago, we co-presented this webinar with our friends at IFMA’s Workplace Evolutionaries community. Our co-authors were Grace Burrows of Work.Life (which is helping our client Verizon with its new coworking venture in London), and Liz Elam, founder of the Global Coworking Unconference Conference (GCUC). 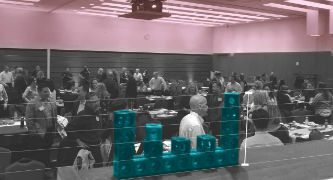 Way back in 2014 this unique conference focused on the growing connections between location-based data collection and analytics (aka location intelligence, or LI) and business intelligence. We wrote about how the retail, entertainment, and leisure industries are beginning to reap great rewards with LI, and how it’s beginning to shape the future of our workplaces, in Work Design magazine. In San Francisco last fall, we moderated panel discussions and gave closing remarks about the digital layer’s indigenousness to the Bay Area buildings that have been largely responsible for popularizing it. Smart building UX in all its ramifications is a theme PLASTARC has been evolving through engagement with WorkTech since 2012. 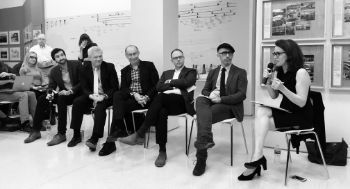 Our beloved AIANY’s Social Science and Architecture Committee hosted this event last month to focus debate around why designers of different building typologies approach social research and human factors so differently.